The Beautiful Walled Garden was built in the mid 18th Century, is home to a variety of kitchen garden produce. Looking for a unique & intimate location for your ceremony? 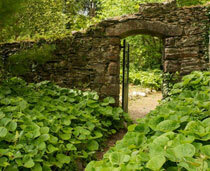 Woodstock Gardens are located in the south east of Kilkenny just outside the picturesque village of Inistioge. The gardens, overlooking the River Nore Valley, offer the visitor a wide variety of attractions and are a most relaxing and beautiful environment in which to spend a day. The gardens are currently undergoing restoration by Kilkenny County Council and further features and planting are being added all the time. 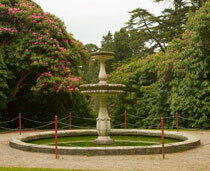 The main development of Woodstock Gardens occurred in the Victorian Period with the works being overseen by Lady Louisa Tighe nee Lennox and head gardeners, Pierce Butler and later Charles McDonald. The gardens are being restored to the period 1840 -1890 with every effort being made to use plants and materials typical of the era. The gardens are home to a mix of formal and informal gardens with an arboretum, walled garden, terraced garden, yew walk and rose garden providing the main interest. 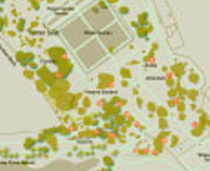 Also of significance are two stunning avenues, the Monkey Puzzle Avenue and Noble Fir Avenue. Also of interest is a rustic summer house, constructed from materials from the gardens and a fountain to replace the original which was sold from the gardens c.1930. The arboretum is home to many fine specimen trees from Asia and South America in particular. A number of these trees are recognised as champion trees due to their size. Nearby to the Arboretum is the Walled Garden laid out with fruit trees, a vegetable garden and a beautiful herbaceous border. 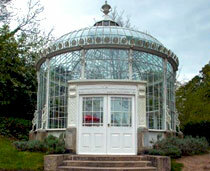 Just outside the Walled garden is our stunning cast iron conservatory which houses the tea shop. Enjoy your visit.